Bart Simpson #86 is the eighty-sixth issue of Bart Simpson Comics. It was released on September 25, 2013. "When Professor Frink's experiments give rise to a group of highly intelligent chimpanzees, Bart and Milhouse find their treehouse overrun by the educated primates. Once their battle plan to take it back is drawn up from beneath the branches of their beloved hideout, Bart and his buddy must prepare for a final showdown that will either lead to conquest or require escape from the Treehouse of the Apes. 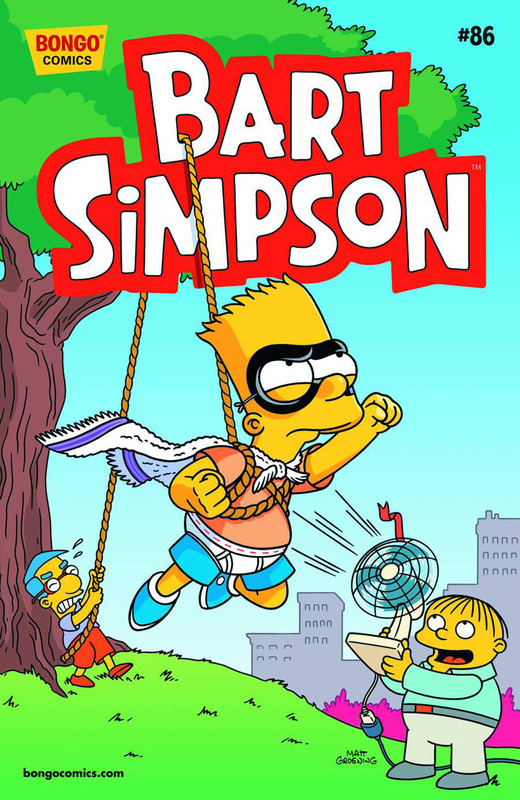 Then, Bart and Milhouse seek out their own superheroic origin stories by attempting to acquire "accidental" superpowers. However, they soon discover that with trying to obtain great power comes great irresponsibility. Finally, Ralph Wiggum takes his place in right field during a baseball game and discovers a world of adventure."